Before you get to the fifth page of text, it will become apparent that you haven’t yet encountered a period. Don’t be put off by that. 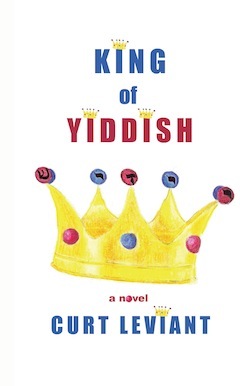 Curt Leviant’s King of Yiddish (Livingston Press, 2015) is a page-turner. It is a comedic tour de force, interspersed with a detective story that will have you following Shmulik Gafni through Poland in an obsessive pursuit. He is hunting the man he witnessed murdering his father and uncle in Kielce, Poland, a pogrom that occurred 14 months after the end of the Second World War. Shmulik is described as an “overlyfull professor” of Yiddish at the fictional University of Israel in Jerusalem. The pogrom in Kielce is a well-known tragedy that did occur, but Leviant’s fertile imagination weaves an original tapestry from that terrible time and place. So, where’s the comedy? The humor centres around a basic human failing: men will be men, and Shmulik falls under the spell of Malina, a Polish Catholic linguist determined to become proficient in Yiddish. She also happens to be half Shmulik’s age and is unbelievably beautiful and well built. Malina is his second obsession. The two stories, solving his father’s murder and getting to the bottom (and the top) of Malina, are interspersed narratives that keep you guessing and entertained. Along the way, the reader encounters a Chassidic un-kosher kidnapping that goes awry (imagine the Marx brothers in black hats) and a bris (kosher or not depending on whether you are Orthodox or Reform) that are grist for Leviant’s mill of linguistic tomfoolery. You meet other academics, letting you in on university rivalries and gossip. Believe it or not, but a cookie with an incredible miniature topping in a Vienna café is an important character in the plot development that might have been written by Kafka, Borges or Nabokov, but it is pure Leviant, plying his considerable art as a fabulist. Leviant also steps outside the narrative and talks to the reader. At one point, the author says you can skip a chapter. Take my advice: keep reading. As you join Gafni in his quest for justice, you will also find allusions to previous works by Leviant. These, he jokingly attributes to famous Hebrew and Yiddish writers, telling us that other colleagues translated those books. One of these is the Icelandic writer, C. Urtl Eviant, a self-referential invention who also plays a role in King of Yiddish. Considering all the word play in English, Yiddish and Hebrew, my favorite occurs when a colleague of Shmulik’s is calling 911. He tells the operator he is a linguist with the City University of New York. Propriety in a family publication requires you figure it out for yourself. Revealing any of the other plot twists would spoil the fun. If you have read Leviant’s other critically acclaimed fiction, you will catch many of the references here. If you haven’t, you may want to back up and read some of his earlier novels. The Yemenite Girl, The Man Who Thought He Was Messiah and Diary of an Adulterous Woman are good places to start. He has produced a body of work that has been widely translated throughout Europe. John Irving has written that he always composes the last few sentences of his novels before he begins page one. Leviant must have done this with his novel. For those of you who like to look at the end of a book before you begin … please resist. King of Yiddish is a gripping narrative that will fascinate you from the opening paragraph to its surprising last. Sidney Kessler is a freelance writer in Glen Allen, Va. His most recent articles have appeared in the Wall Street Journal and the Richmond Times-Dispatch.